It’s true in every corner of the commercial art world that if your artwork is attached to a popular product then your art is going to benefit from that association. The popularity rubs off, so to speak. It’s especially the case in Magic, and probably all collectible card games. If your art graces a hot (and most likely) rare card then you’re going to be able to sell more prints, charge more for the artist proofs and if you’re working in traditional mediums, ask a nice sum for the original art too. It’s all about demand. But it goes further than that, the perceived value – that is to say the quality – of the painting itself is changed in the minds of the card buying public. I have some early paintings that aren’t remotely close to the quality I produce today, but they’re on popular cards and I sell prints of them at every show. And I have some paintings I’m really proud of that’ll never sell a print because of where they landed, usually a junk common that no one cares about. And that’s the curse of commonality. Tomorrow (yes, really, three updates in a week!) I’ll show you one of my favorite paintings that you may never have paid any attention to as it was lost to a junk common. Image courtesy of the fiendish Magic Cards with Googly Eyes Tumblr where I have discovered my art is featured with frightening regularity. 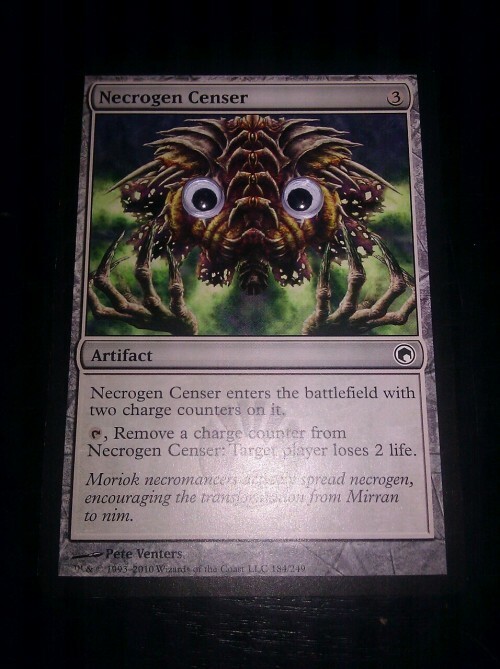 Man, I think the eyes totally improved the Necrogen Censer. Just look at it, it’s absolutely cute now… like some raggedy left-for-wet Pokemon.